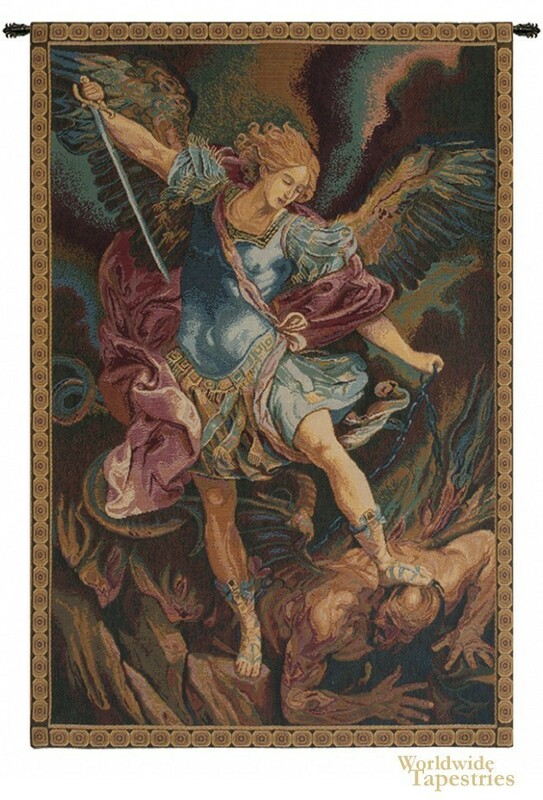 In this religious art tapestry "St Michael" based on the original by Guido Reni (1635). It was for Capuchins' Church in Rome that Reni created this rendition of archangel Michael. A painter in the high-Baroque style, Reni created a multitude of works including those of religious and spiritual nature. Here we see St Michael treading on the forces of the underworld in this dramatic scene, which was a highlight of the Baroque and Renaissance style religious art. The colors of the angel's garments echo throughout the work in the skies and his wings. The blue color signify his power and the purple represents his wisdom. Finally a beam of white light illuminates the scene. This tapestry is backed with lining and has a tunnel for easy hanging. Dimensions: W 12" x H 19"
Dimensions: W 17" x H 24"